Is it possible to solder die-cast metal? That's terrible, is that a Broadway engine? I don't know about soldering that back together, but I would first try contacting the manufacturer to see if they have spare parts. Maybe a new part can be crafted out of brass stock? 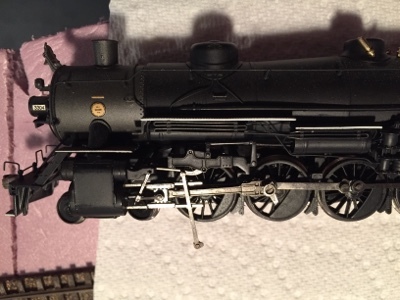 The Bachmann 2-6-6-2's are a major workhorse in my steam fleet, I was lucky to buy a junker to keep around for spare parts in the future. I'd look around for something similar. Good luck. It's a Bachmann 4-8-2. I need to look at the rods more closely to see what they're made out of, but offhand, I'm not optimistic solder will work. I may try ACC - especially since this rod isn't under any tension, it just goes along for the ride. Unless, of course, it's misaligned because the idiot owner didn't check it for proper orientation after putting the drivers back in. %^) As for spare parts, I'm not sure Bachmann stocks parts for these anymore, but I may have to at least try that route. Stay tuned! Bachmann has a pretty good parts list on their website. I would suspect the Light and Heavy Mountains use the same mechanisms. If that's true then these might help as a direct replacement.